Pushing through the final details! The men are hanging the light fixtures and painting the ceiling while I’m dusting out and re-organizing the cabinets. It’s December and should be prime season for red wine, but it was 81 degrees today. There are two young men outside spreading dirt and they are working up a sweat. The wine fridge is booby trapped by a swathe of floor patch. I already skated through it once today. I’ve learned my lesson. 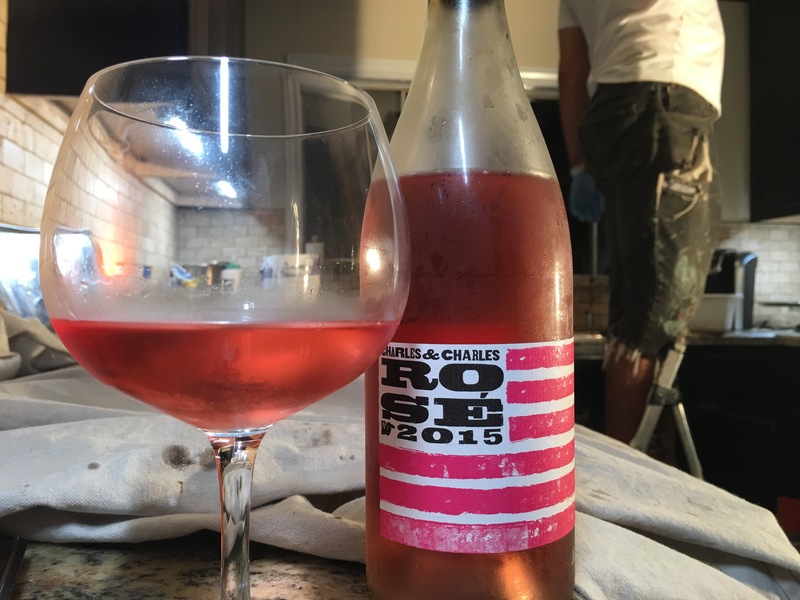 So Charles & Charles Columbia Valley Rose 2015. Bursting with cherry, watermelon, woody stems, and a faint trace of bubble gum! $12-ish as I recall! Goes down boldly and easily. It’s a blend of 61% Syrah plus Mourvèdre, Grenache, Cabernet Sauvignon, Cinsault and Counoise! This Rose is just dying to talk to you and your palate!! And after a day of remodeling, it’s a conversation I’m ready to have.